Childhood is that part of one’s life which people always remember and cherish. The same goes for childhood friends- they hold a special place in our heart. If one has the same companions from childhood to the adult life, it gets all the better with people having shared experiences coloured with sentimental ardour and friendly fondness. The childhood innocence, the quirks and oddities of adolescence, and the notion of maturing and growing up together always makes for a good story- something that readers can relate to and sit up on their reader’s seats and feel a great deal of emotional warmth about. 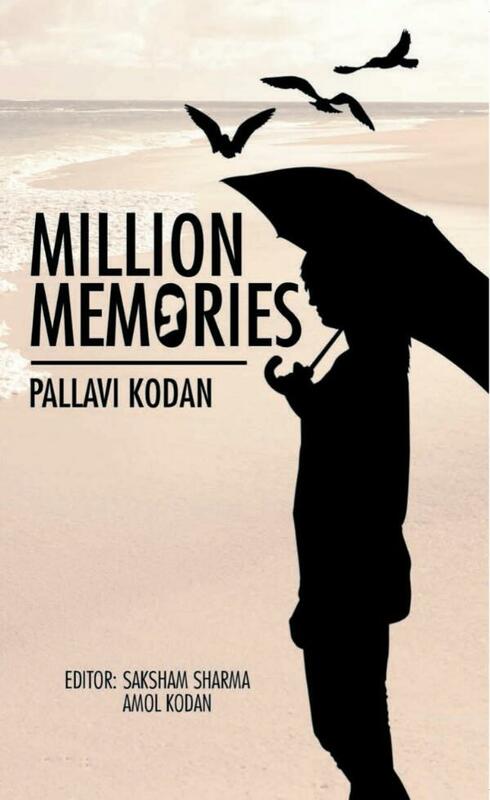 The author Pallavi Kodan comes up with such a book “Million Memories” which details the intertwined stories of three protagonists from childhood to their adult life, with various emotional upheavals and relatable experiences thrown in. The book cover is very appealing. It shows a silhouette of a woman holding an umbrella, with seagulls flying above, and the background is formed by the soothing pastel beige-coloured sand of the beach. The letter “O” in the title Million Memories also has a graphic portrait of a woman inside- with her chin up and a beaming regal side pose- which tells the reader that this book will be having strong woman protagonists. The blurb at the back cover is very short, and as a reader searching for a perfect book to pick up and read, one needs a better glimpse into the story to make a better choice. The storyline follows three friends- Aashima, Siddhant and Karishma who grow up together. It details their growing up from crushes, fights, and love to the big bad real world. It shows how their different backgrounds but common friendship shapes them up as individuals. The character formation is good, with the intricacies and nuances of the main characters which are very different from each other, explored in depth. However, the story is predictable with not much of twists and turns incorporated in the story. The language used is simple with the book being a light read, but there are many editing glitches which should be looked into in the second edition. This is a book that should be read for its subtle emotional quotient and characters that are both vulnerable and strong at places- in short, characters that are very much real-life and truly relatable. The story drags at places, but the delight of reading about the simplistic yet interesting life of the protagonists, and the challenges that they face with perseverance and conquer with élan, keeps the reader engrossed.